A portion of a machine's energy was always lost in the transfer of power to that being lifted, whether by belt, chain or hydraulic fluid. Friction was the foe! In the Gallery on "Belt Drives," we saw how these connectors were made ever shorter in the continuing thrust to develop a "package" of the power source and drive. The screw was an option to the leather or chain belt, but the loss of energy remained. An exceptional amount of roping also ate up energy. Lifting engineers knew the answer lay in a direct connection between the power source and the drive sheave even though friction between worm and gear would remain a problem. For many years, the more compact direct-connected drum machine was seen as an answer even though its faults were many. When the direct-connected traction drive was perfected, slippage replaced the inefficiency of poor rope leads and excessive roping and higher rises became possible. The answer was the compact gearless machine with the slow rotation motor within the drive sheave, a traction drive that allowed delicate control of the car at high speed with a lesser amount of machine maintenance. In the "Human Interest" Gallery, Dr. Joris Schroeder discusses the nature of the delays in perfecting the gearless machine package and its accessories. When this most compact of drive units did arrive, the building of higher and more efficient skyscrapers was possible. The windlass was the earliest device by which early man wound rope upon a drum; in the Gallery, "Birth of Systematic Agriculture," a tree trunk was used as a drum. The drums were gradually refined and many came to be driven by reciprocating pistons of steam and gas engines. It was natural that elevator manufacturers and engineers saw the drum as the answer to the need for a direct-connected electricity-driven hoisting machine. It was also natural that several other systems were developed that used electricity but not the drum. As the roped hydraulic had been a popular choice for high-rise buildings for a number years, a number of manufacturers and owners were prone to remain with a system that had afforded the safety of multiple host cables. The advent of the drum direct-connected machine was hotly contested by the Pratt-Sprague system, but with the failure of the latter's core component -- the drive nut -- the drum emerged a winner. It was to remain popular for low-rise heavy-duty lifting, but as elevators were called upon to serve ever-higher buildings, the baton was passed on to the direct traction machine. 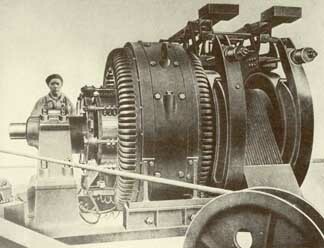 A number of early elevating innovations were to regain their popularity in modern times; the traction drive was first developed as an adjunct to a steam-driven mine hoist. The modern traction machine was more compact than the drum machine, just as the latter had taken up much less space than the roped hydraulic drive. As buildings became taller, the amount of hoist cable wound around the drum became lengthier and the drum wider, with the lead of the single or dual hoist ropes shifting from one side to the other. On the other hand, the traction drum was narrow, and the lead from the greater number of hoist ropes always remained straight and centered. A problem with the traction drive was rope slippage in the drum grooves. Calculations were developed for carefully formed grooves and for the proper sized rope of the correct metal composition and construction. Rope became an even more important accessory. Slippage had a benefit; if a car or counterweight overran a terminal, the slippage in the traction sheave would eliminate the kind of damage that would occur with a drum type should the car or counterweight strike the overhead and the ropes be pulled out of their sockets. Without the manual terminal stops built into the water hydraulic and electric drum machines, a greater reliance was placed upon electrically operated directional and final limit switches placed appropriately in the hoistway. The gearless elevator was one of the major new developments in elevator technology that accompanied the proliferation of high-rise building. The first such system was installed in the Beaver Building in New York in 1903, followed by the Majestic in Chicago a year later. The gearless traction elevator differs from the types of elevators previously described, as the use of a slow speed motor directly connected to the driving sheave eliminates the necessity of using motor speed reduction gearing. The result is a machine of great simplicity. The relatively few parts and the compactness of the gearless elevator make it the ideal drive for high speed work. Smooth, steady motion of the car is assured under all conditions, although the machine is primarily designed for the high-speed service of the taller buildings.